The Consumer Electronics Show (CES) marks the beginning of the new tech year. Gathering together the world’s leading innovators, the show is a dazzling array of product announcements and brand conferences. There are plenty of opinions out there about which products will be big hitters and which will fall by the wayside, and you can find a list of CES roundups at the bottom of this post. But Which Brands Won on Twitter? You’re in Vegas, listening to exclusives announcements, handling the products, smartphone in hand...and you have a comment to share. 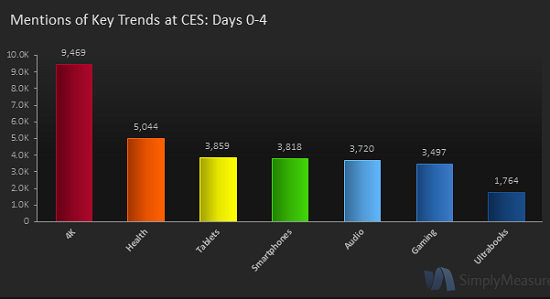 Unsurprisingly thousands did and Twitter was buzzing with #CES2013, #CES and #CES13 hashtags throughout the week. While it is always good to hear about ‘hot topics’ from industry experts, what about the majority vote? Simply Measured tracked and analysed over 350,000 tweets and the results are in. Samsung took the top spot with a 7% share of Twitter mentions during the event. Several announcements would have contributed to the win. First came the prototype ‘phone with the bendy display’. Samsung have been “working on flexible displays for several years” 2 and we can now look forward to a whole new range of devices with "bended, foldable and moulded screens". 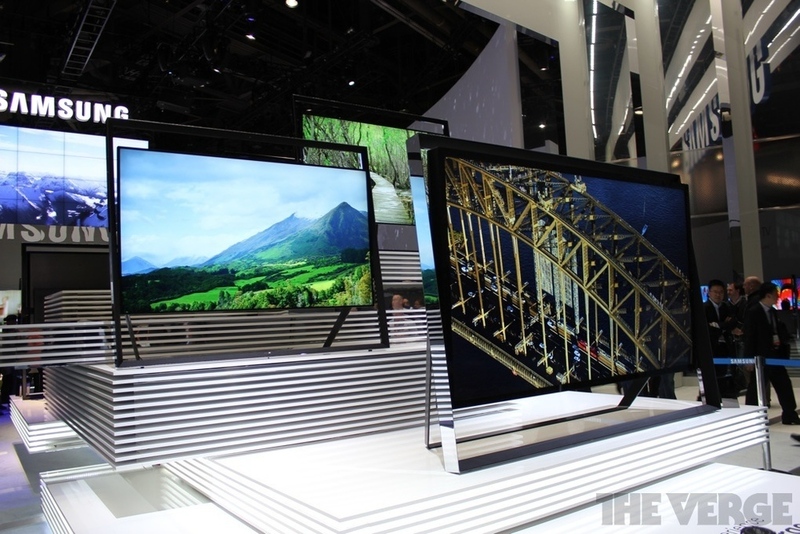 Next came the 4K Easel TV, one of several 4K announcements from top brands including Sony. 4K easily topped the chart for key trends, with nearly 10,000 mentions in just 4 days. 4K TVs “are basically IMAX screens for your living room”1, and they could be the “first TVs to demand a room redesign since flat panels first arrived.”3 What do you think? Worth moving the sofa for? You might need to consider the prices tag as they are likely to remain out of reach for most of us for some time, starting at under $30,000. Ouch! Then there was the press conference. It’s always helpful to have a few friendly endorsements! You can find more CES Twitter insights at Simply Measured, including daily brand mention spikes, a 2012 comparison and the top tweeted domains. Post event, it seems all eyes are on Samsung. So let’s wait to see if all the Twitter hype will be justified.